MedHacks › Detoxify Medicine by Hacking! This acronym does not include “reliability” which is part of the original publication. I guess in Filipino that will be “Maasahan”. When a man decides to build a house, he does so with great apprehension. This is because the costs tend to be beyond his means and he probably will need to take a loan from the bank. Another reason is that the building process itself is complex, involving huge investments and commitment from many people ranging from the architect who designs the house to the plumber who lays down the pipes to the owner who will eventually live there. Adding to the anxiety is the fact that they do not know each other nor trust each other that much. It is therefore customary to prepare a blueprint prior to construction. The blueprint serves as a common reference point for every stakeholder involved in the project. Between the owner and the architect, they share the same vision of how the whole structure will appear and function. For the engineer and the contractors, the blueprint tells them what materials will be used. Once the structure is built, then it’s the interior designers’ turn to put in the appropriate furniture and fixtures in each room. At the end of it all, if the blueprint is followed faithfully, the owner is satisfied. It will be a coherent structure built by many hands pursuing a common goal of a comfortable home for a family. The blueprint serves as a contract of sorts. especially when its own drug fails the quality tests. flawed analysis and we will not be able to see the complete picture of the country’s health situation. Lastly, they have the flexibility to implement the Enterprise Architecture and the accompanying standards in their local health systems. A true and sincere partnership with the private sector will result in faster deployments which can redound to more effective information systems on the ground. In the end, if DOH does the right thing right now, Juan dela Cruz can enter any health facility and get the service he needs without worrying about whether it will be covered by PhilHealth or not. Repetitive lab tests are detected and avoided, and the health system is financed more viably because it is more efficient. Filipinos can now appreciate their health system, and begin to understand universal healthcare. Any Juan will be happy to live in a home like this. (Note that since this is an analogy, it is by no means perfect nor comprehensive. Its purpose is to pose a certain view of an abstract thing called the national health information system. Other views should be considered as well, but they should also be subjected to the same level of scrutiny that this will receive. The author’s contact details are Alvin Marcelo (alvin dot marcelo at gmail dot com). Q: How do we deal with current existing vertical information systems under the EA plan? Ans: Vertical systems are results of poor (or lack of) architectural design. Often we blame information systems for these vertical programs but if you look closely, these information systems were simply artifacts that reflect the realities of the business processes. If you dissect the business architecture layer, you will see that the health programs are in fact operating in silos themselves. These silos/vertical programs are detrimental to health service delivery and must be fixed — but how? This is one of the biggest challenges in eHealth right now — When you have mature information systems for vertical programs such as the TB and malaria, how do we re-integrate them? Interestingly enough the answer seems obvious — re-orient information systems around the point-of-care (at the patient level) since all services converged with the patient and not with the programs. Thus while programs may be vertical, the patient remains the locus of interest or the hub where these vertical programs intersect. Therefore, a patient-oriented electronic health record design could be an effective way of dealing with vertical programs — a system where the patient’s longitudinal records are accessible from his/her perspective. Q: Is UMID part of the EA plan for data collection? Is a unique ID an integral part of HIS? Ans: Not yet. The reason is that the UMID still does not assign a common reference number (CRN) for every citizen in the Philippines. Only formal employees have SSS. Only government officials have GSIS. Pag-ibig is optional. Only PhilHealth assigns a unique number for every person (including those below 18 years of age) thus the PhilHealth number is the national health identifier for use in the national eHealth plan. Having said that, there is a Citizen Registry project in the works. This could be the client registry component of the Philippine Health Information Exchange. Q: What’s the bigger problem for capacity building – tech infrastructure or human capital? Ans: Human capital because all tech are operated by humans in the end. But there should be parallel build-up of tech infrastructure with human capacity so they are in sync. Q1: If TOGAF is used as the #EA for the Philippines, who are the process owners of TOGAF categories Biz,Tech,Data, App? Data ownership is by the business process owner. Application and technology owner is KMITS (formerly IMS). Q2: How will the private sector’s role be articulated in the current EA being used for the Philippines? Q: In the DOH #EA under service access & delivery, there is no mention of a network provider, should a specific company be identified to set the service standard? Ans: Usually, no specific brands are placed in an enterprise architecture, rather it contains specifications. This provides leverage to the client as to who to contract within the constraints of those specifications. Q: What does the “for conversion” status mean in the Political Profiling System of the DOH Application System? Ans: This means that the existing system will be upgraded/converted into a newer version. Q: Is the DOH getting additional funding to improve its ICT or is it just working around the govt budget allotted? Ans: Yes. The DBM has created the Medium-term IT Harmonization Initiative (MITHI) to fund integrated electronic services between agencies. IT Infrastructure Library is a framework for the delivery, service, and support to enterprise IT. ITIL maps to COBIT5’s “Deliver, Service, Support” domain. EA is enterprise architecture or blueprint of an enterprise IT. 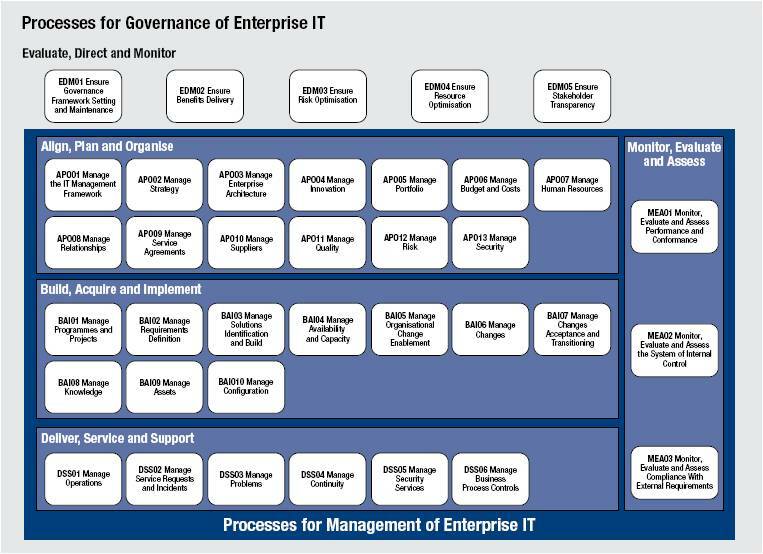 EA maps to COBIT5’s “Align, Plan, and Organize process 03” (APO03). 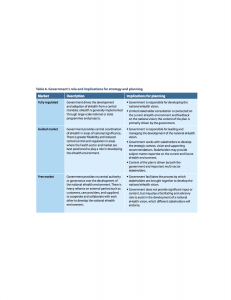 See this image which shows how all other frameworks fit within COBIT5. Q1: Between the 4 EA framework, w/c would be the most applicable to the Philippines and why? Question#2: What are the characteristics of the PeHSP for us to use your answer in Question#1? Ans: I asked JayC to try answer first and then I will share mine. I have my own answer but it would be good to hear how the students think. Ans: Any change is inevitable. But the change should be managed so that the stakeholders can accommodate it. TOGAF’s Architecture Development Method (ADM) Phase H shows that change management occurs after the opportunity (in Phase E) has been identified, migration planning has been done (in Phase F) and implementation governance has been applied (Phase G). Ans: An Architecture Board is key to managing the EA. The EA Board ensures that the EA is clearly depicted and communicated to the relevant stakeholders of the enterprise. They are also responsible to ensuring that the changes can be realistically made. The eHealth TWG stands as the Enterprise Architecture Board for Health and they report to the National eHealth Steering Committee. This means that the TWG is the responsible entity to ensuring that an EA is created and maintained on behalf of the Steering Committee. Ans: Although private sector can be compelled with policy, the best approach is to make them see the benefit from their own perspective. The private sector is included in the PeHSFP through the ICT4H TWG and the Adviser’s Group> They are consulted for their insights and opinions. No it will not. There are at least three layers of interoperability that need to exist before data flows effectively — business, information, technology. Open electronic medical records can address information and technology interoperability but cannot assure that there will be business interoperability (that is, two entities agreeing to do business with each other). The article is interesting that it actually states that information and technical interoperability already existed but a disagreement in how to run the business prevented the exchange of information. Similar cases abound in healthcare. In the US, the EMRS got bigger before the Health Information Exchanges became mature (the information and technology interoperability layer). In such a situation, it becomes harder for mature EMRS (like EPIC) to connect “back” to an HIE (this is logical because the EMR has more features than an emerging HIE). The lesson is to quickly define the HIE and ask the EMRs to connect to it. Up to a certain point but not beyond it. openEHR helps organize clinical knowledge and structure it consistently. That helps with managing the complexity of clinicians having varying ways of representing their knowledge (see the mindmaps of those who participated in the openEHR workshop). All group members were given the same clinical scenario but all groups have varying mindmaps for that case. If they proceeded to create the EMRs from the mindmap, for sure, their EMRs will not be interoperable because they had already diverged at the clinical knowledge layer. openEHR is like a bucket of lego blocks from where you can get pre-built blocks (representing clinical knowledge) which you can then put together to create your EMR. Since all of you got your building blocks from the same bucket, the chances that your EMRs can connect is higher. 4) First things first, EMR for different departments in PGH and make them interoperable, fully accessible by healthcare provider? First definitions: an EMR is an electronic system for recording patient data in one facility. An EHR on the other hand is a person’s longitudinal record which may comprise of data coming from different EMRs. So in PGH, ISIS is the EMR of the Department of Surgery. In IM, they have their own EMR. But patient Juan dela Cruz should only have one EHR which is a collection of his data from Surgery and IM. How is this possible? Through interoperability — a system that allows the collection of Juan’s data from the different EMRs where his data resides. Do we need to design this from scratch? No, the Integrating the Healthcare Enterprise (www.ihe.net) has already described how this could be done in a health system. Q: Where are we in the development of #EA for the Philippine eHealth or HIS? A: In a proper EA methodology, you need to first identify the scope of your enterprise and then its stakeholders. In a national eHealth strategy, the enterprise is the whole country making it a very complex enterprise with many stakeholders often with competing interests. One way to approach this activity is to partition by consolidating the government perspective first and then widen through public discourse and hearings. So the answer to the question is that DOH, PhilHealth and DOST have consolidated their viewpoints into the eHealth Common Government Platform (view) and they will present this for public comments on October 20-21, 2014. It is far from over and far from perfect. It is through participation that the EA can reflect the viewpoints of as many stakeholders as possible. Q: If #EA serves as a framework, should we stick to it, or can it be revised/evolve along the way while it’s practiced? Frameworks are attempts at organizing complexity. Have you tried arranging your books? Sometimes you try one (alphabetical) but then change your mind (by height). Then you Googled and learned that there is Dublin Core – a way to arrange books properly so that you can go to another library and find your way without knowing the librarian there. You learn that Dublin Core is a standard. Arguably, EA’s need to be well-thought out and researched. And there is a science to building EAs (TGAF, Zachman, etc). For sure, building expensive complex health IT systems without an EA is formula for disaster. And having an EA does not mean you won’t fail — but you’ll know you’re in a path to failure early. Having said that, you also need to be on the lookout for risks and if those risks are related to a wrong EA. In these cases, you should revise the blueprint through the agreed change management process. Q: How do we know we’re in the right path to building them? That it’s “correct”? In COBIT5, you set the benefits, risks and resources based on your engagement with the stakeholders. These are your milestones. Are you achieving your benefits? Are the risks being controlled? Are your resources enough? These tell you that you are on the correct path. 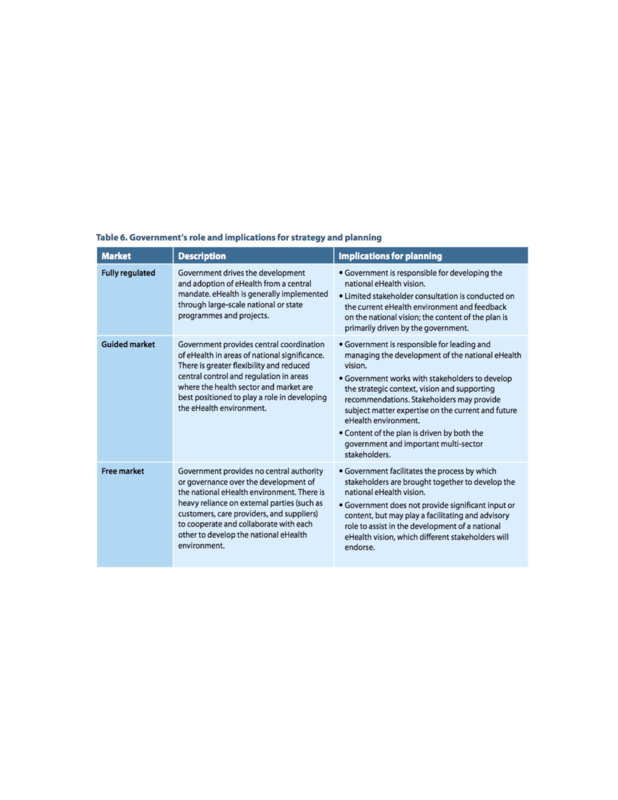 Monitoring the “benefit-risk-resources” triumvirate is the key to governing your IT project.